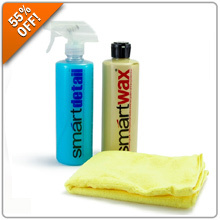 The Smartwax Detail kit includes one bottle of Smartdetail spray, one bottle of Smartwax and one premium microfiber towel. Easy to use, you'll love the high-gloss detailer as well as the 100% Brazilian Grade A Carnauba Wax. Bring out the best in your paint finish and protect it at the same time! Now you can take 55% Off when you Use Promo Code SMART55 at Checkout! Offer valid through June 30th!